When Kamuran Aker first came to America, he dreamed of continuing his craft of leather manufacturing. Originally a belt, shoe, and handbag maker, Kamuran made it his purpose to expand his unique style of leather craft and attention to detail into the law enforcement market. His commitment to the old world values of craftsmanship and tradition combined with a unique sense of modern style quickly gained the attention of law enforcement agencies across California and the Southwest. Today, agencies across the nation trust Aker Leather for their on duty and off duty gear. Aker Leather Products is a leading manufacturer of high quality leather holsters, belts, and accessories. Designed and manufactured in the USA since 1981, our commitment to craftsmanship and tradition is much more than just words – it’s a way of life we’ve held for two generations. We manufacture all of our products in Chula Vista, California in the same factory where we made our first holster with many of the same people who helped us grow into the company we are today. 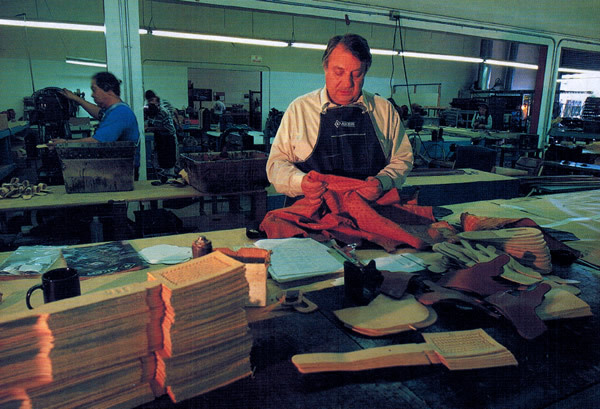 The craft of leather is one of the oldest traditions still in practice across the world. In the United States, there are few companies with the know-how and commitment to produce quality leather products while still selling them at an affordable price. Making you the right holster at the right price is what we strive for every day. Like a fine pair of shoes, leather products are made to last and become more comfortable and reliable over time as they wear to suit their owner. Aker products do not roll off an overseas assembly line with the push of a button. Every Aker product is made in the USA because we demand a level of quality behind our products to ensure your safety that only domestic materials and labor can produce. No detail is overlooked. Every cut of vegetable tanned full grain US cowhides, every heavy duty nylon bonded stitch, every sanded and polished edge, every hand dyed and hand oiled piece, every solid brass screw, buckle, snap, and rivet, and every hand molded and hand boned product is crafted by a group of dedicated workers in Chula Vista, CA. Police departments across the nation, such as the Los Angeles Sheriff Department, LAPD, San Diego Sheriff Department, San Francisco Police Department, California Highway Patrol, Honolulu Police Department, Amarillo Police Department, choose Aker products for their academies. Federal agencies such as Border Patrol, DHS/ICE, FBI, US Postal Inspection, and Naval Special Warfare Division choose Aker because Aker provides the product quality and reliability required to protect our nation. You can find Aker products in uniform stores and police equipment stores across the nation and online. Our trusted dealer network extends our commitment of quality, service, and consistency to you, our valued customer. No matter where you purchase, we want you to carry with the confidence that only Aker can offer. Contact our Customer Service Department at (800) 645-AKER (2537) or click to email us to find a dealer near you.